Originally signed by the San Francisco Giants as a 17-year old out of the Dominican Republic in 1994. Traded to the Chicago White Sox in 1997 & made his MLB debut in 2000. Pitched for the 2000 American League Central Division Champions. Pitched professionally for 19 seasons in MLB, MILB, Mexico & Venezuela. Won a Gold Medal as a member of the Dominican Republic National Team that won the 2013 World Baseball Classic. Drafted in the 40th Round of the 2015 MLB Draft by the Houston Astros. Pitched the past season for the Greeneville Astros, Tri-City Valleycats, Quad Cities River Bandits & the Lancaster Jethawks. Pitched collegiately at Angelo State University and Cochise College. He was the 2015 Lone Star Conference Athlete and Pitcher of the Year while at Angelo State. He was also named a Daktronics NCAA Division II 1ST Team All-American. At Cochise College, he helped his team reach the NJCAA World Series in 2013 and 2014. In 2013, he was named the NJCAA World Series Most Outstanding Pitcher. Currently coaching with the Catalina Foothills High School Baseball program. Originally signed by the Chicago White Sox as an 18-year old, Santana would go on to play 12 years of professional baseball. He played professionally for the Arizona Diamondbacks, Cleveland Indians, Chicago White Sox & Oakland Athletics organizations. He also played for the Tucson Toros in 2009 & 2010 where he was named a Golden Baseball League All-Star. Played collegiately at the University of New Mexico. Former Head Coach at Pima Community College(1998-2010). Current Dean of Athletics, Fitness & Wellness at Pima Community College. Starting in 2000, he had the unique opportunity to work with USA Baseball first as an assistant coach for the 18U Junior National team and then as the Head Coach. In 2002, he led the USA Junior National team to a 3rd Place finish in the "AAA" World Junior Baseball Championship held in Sherbrooke, Canada. While with the USA Baseball program, he had the opportunity to coach 8 future Major League Baseball 1st Round Draft Picks. Drafted in the 30th Round of the 2017 Major League Baseball Draft by the Minnesota Twins. Played professionally in 2017 for the GCL Twins and the Elizabethton Twins. 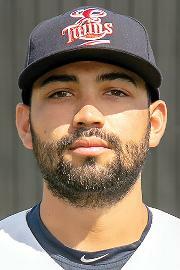 This past 2018 season he played for the Elizabethton Twins, Fort Myers Miracle(A) and the Chattanooga Lookouts(AA). Played college baseball at Austin Peay State University where he was a 4-year starting pitcher, utility player and designated hitter. At Austin Peay, he was a record 5-Time All-Conference selection including being named 1st-Team as a starting pitcher and utility player in the same season. He was selected to the John Olerud Two-Way Player of the Year Mid-Season Watch List 3 times including being named to the Top 10 in 2015. Only player in NCAA history to ever record a win as a pitcher, hit for the cycle(1B, 2B, 3B & HR) and go 5-5 in the same game. Drafted in the 31st Round of the 2017 Major League Baseball Draft by the Toronto Blue Jays. During the 2017 season, he pitched for the Bluefield Blue Jays & the Northwest League Champion Vancouver Canadians. In 2018, he pitched for the Lansing Lugnuts(Single A Affiliate-Toronto Blue Jays). Prior to his pro career, he pitched for 4 years at Quincy University helping lead the Hawks to a Great Lakes Valley Conference Championship & their first appearance in the NCAA Division II World Series. Arias was drafted by the California Angels in the seventh round of the 1993 Major League Baseball Draft after playing for the University of Arizona. He made his major league debut in 1996, and played 84 games, hitting .238 with seven home runs and 28 RBI. He played with the San Diego Padres from 1997-1999, before joining the Orix Blue Wave in Japan. Arias became the regular third baseman in his first year with the Blue Wave, and was the team's best power hitter, hitting 38 home runs in 2001. He was a solid fielder, and had a strong arm. He signed with the Hanshin Tigers in 2002, and hit 38 home runs with 107 RBI in 2003, contributing to the Tigers' league championship. He also won a Golden Glove award at first base, and the Best Nine award that year. He left the Tigers after 2004, and signed a minor league deal with the Washington Nationals in 2005 and then played in the Mexican League for the rest of the year. Arias was signed by the Yomiuri Giants in June 2006, and made his debut with the Giants in July as an outfielder. In 639 games in NPB, Arias hit .259 with 169 home runs and 436 RBI. Arias currently resides in Tucson Arizona with his wife Rachel and his three children. He coaches the Tucson CHAMPS Club Baseball teams and is well known in his community because of the passion and dedication he has to the professional and personal development of baseball players at all ages. Graduated from the University of South Florida(B.A.-Mass Communications) in 2004. Ryan was the Head Manager for the South Florida Bulls baseball, football and men's & women's basketball teams from 2000-2004. Since 2008, he has served as the General Manager of the Centerfield Nationals(formerly Tucson Nationals) Summer Collegiate Baseball Organization. Previously, he was the Owner/Promoter for USA Main Event Entertainment/NWA All-Star Wrestling in Virginia, West Virginia, Kentucky, North Carolina and Tennessee.